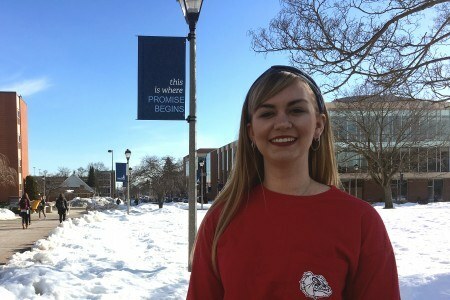 SPOKANE, Wash. – I would not be able to attend Gonzaga University without the support of donors whose scholarships are allowing me to pursue my passions in a supportive, uplifting and challenging environment. I have wanted to pursue writing from an early age and began penning short stories in the second grade. My family always said I would write professionally one day. I have studied vocal performance through private lessons and musical theater since age 8. My theater and dance studies with the performing arts high school Las Vegas Academy, and involvement with local theater group Rainbow Company deepened my appreciation for the arts. During my senior year of high school, I studied at College of Southern Nevada High School where I took 12 college credits and my required high school classes each semester. Now, I am a junior journalism major with a minor in interdisciplinary arts, which includes studies in music, dance and theater. Upon my acceptance to Gonzaga, I received the Regent’s Scholarship worth $16,500 per year, a Gonzaga grant and a music scholarship. This support has allowed me to attend a school that fosters my love of the humanities every day. When I first received my aid package from Gonzaga, my parents told me I probably could not attend unless I received a larger need-based grant. After visiting campus and meeting faculty, I couldn’t picture myself anywhere else. My parents approached the Financial Aid Office while the three of us attended a preview day, and I received a new offer less than a week later. Gonzaga made my dream a reality. My music scholarship covers my involvement in women’s chorus, an ensemble in which I serve as president, and applied vocal lessons. Without this scholarship, I would not be singing with faculty that inspire me and women who have become my family. Music is essential to my happiness, and I am grateful beyond measure to be able to hone my craft in college. Gonzaga offers me a plethora of growth opportunities outside of the classroom as well, including writing for the Gonzaga News Service, religion reporting through my internship with Spokane Faith & Values, writing feature stories for the local daily newspaper The Spokesman-Review, and writing and editing for our school newspaper The Gonzaga Bulletin. I also serve as a public relations representative for Gonzaga Dance Council and Boundless Dance Club, and have taught lyrical ballet classes to students in the past. Thank you to everyone who gives to help students like me attend Gonzaga. Please know that without these scholarships, I would not be a part of this incredibly vibrant learning community that is Gonzaga improving my writing, serving my community through my love of the arts, and approaching the world through a more broad and compassionate lens. Your support matters to me and so many other students more than words can express.